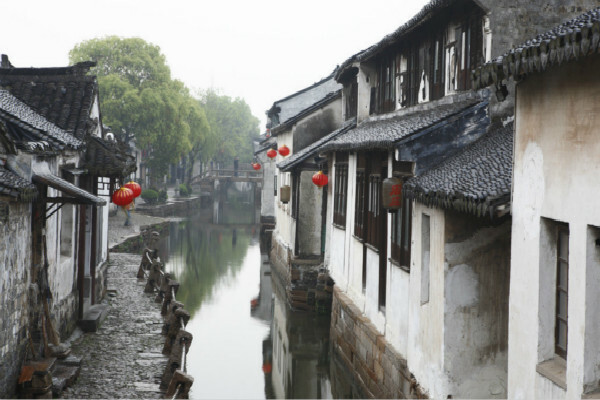 Zhouzhuang embraces the beauties of all the water towns in China - old bridges, traditional buildings and small streets on the banks of waterways. Its Shuangqiao Bridges (Twin Bridges) that became famous worldwide because of the painting Memory of Hometown by well-known painter Chen Yifei (1946-2005) and its display in a New York gallery in 1984. Another bridge in the town, Fu'an Bridge (Wealth and Peace Bridge) is the only existing structure in southeastern China that perfectly combines a single-arch bridge with abddge tower. 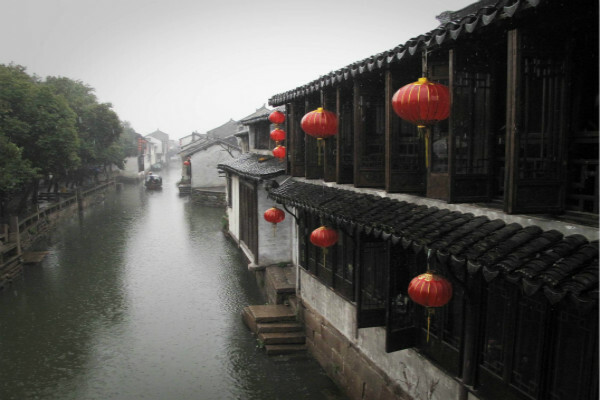 At the middle between Shanghai and Suzhou lies Zhouzhuang, an ancient town of Kunshan City, Jiangsu Province, where abounds with rivers and lakes. So it is thought by many to be the best waterside town in China. 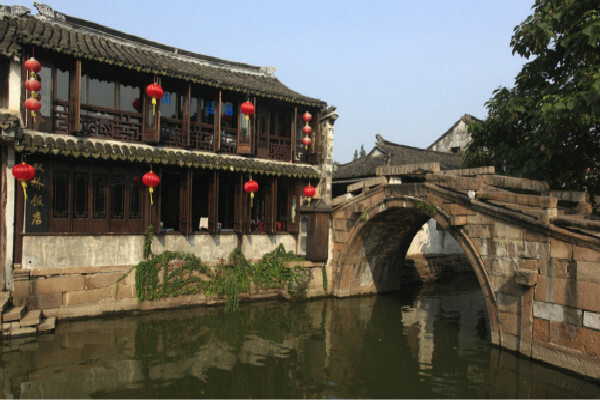 This ancient town has a history of more than 900 years old with many houses built in the Ming and Qing Dynasties. There are about 100 houses with courtyards, and 60 of them have arch gateways made by carved bricks. With lakes on four sides, the beauty of Zhouzhuang is specially to be found along the waterside lanes and around a number of the stone bridges. A different vista at every turn can be found here which make a visit most enjoyable. Also, one can enjoy the fairyland atmosphere of the evenings here when the myriad stars twinkle as though in communication with the glittering lights. Shen's House is located to the southeast of Fu'an Bridge on Nanshi Street. It was built in 1742 during the Qing Dynasty by Shen Benren, a descendant of Shen Wanshen who was a man of wealth in southern China in the late Yuan (1206-1368) to early Ming Dynasties. The house consist of seven courtyards, five archways, more than 100 rooms of different size along two sides of a 100-m-long axis road, which covers an area of 2000 sq.m and offering a unique traditional Chinese architectural style. Shen’s house has three sections. The first includes the hinged water gate and wharf for mooring boats. The second one consists of the Tea Hall and Main Hall for receiving guests and holding wedding or funeral ceremonies. The rear part serves as living quarters. The Main Hall covers 170 sq.m. The 6-m-high carved brick archway, facing the Main Hall, is the most magnificent among the five, with a horizontal inscribed board bearing the inscription, “Jihouliuguang (do more good for ever)”. Around the board are relief sculptures of figurines, animals, pavilions and opera characters. Twin Bridge consists of the Shide and Yong'an Bridge, which was built between 1573 and 1619, and is situated to the northeast of the town. The Yinzi and Nanbei rivers cross the area and the bridges are built in one in the direction of north-south and the other east-west, with one square and one round opening. Since they look like an ancient key, it also known as Key Bridge. Chen Yifei, a young artist residing in the U.S. created a picture "Memories of Hometown" based on the Double Bridge in 1984. The painting with Chen's other 37 works was exhibited and bought by Dr. Armond Hammer, an American oil tycoon who later presented them to the late Deng Xiaoping. The painting symbolizes the friendship, cooperation and peace between the two countries. In 1985, the painting was used on a first day cover issued by the UN, so that more and more people come to know Zhouzhuang's beauty.